In recent years we’ve witnessed Apple products transform from an obscure symbol of luxury in China to a mainstay in the digital landscape. On an average day in Chengdu you might see hundreds of people clutching iPhones, from the subway to the park to the bank. It’s no longer just a symbol of affluence (although it remains that), but it’s become a practical tool of modern life that Chinese want just as much as anyone else. They want it so badly in fact, that Apple has recently taken major initiatives to court Chinese users. 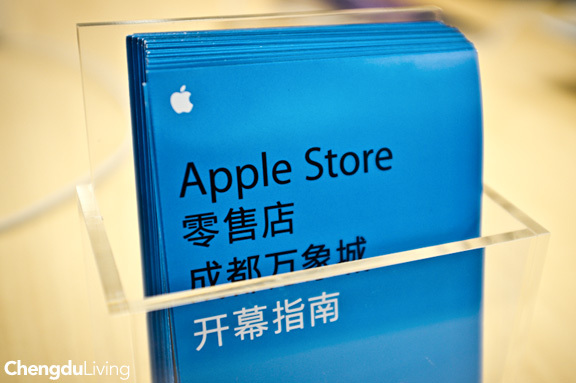 One of these is opening the first official Apple Store in Western China, located in Chengdu. The opening of this Apple store, on Saturday the 15th, coincides almost perfectly with the release of iPhone 5 in China on the 14th, too. Between all of the recent product releases and successful expansion into China, Apple is almost certainly looking at record-setting fourth quarter revenue. We’ll see if that stabilizes Apple’s recently-tumultuous stock price. Over the last two years Apple has come to not only understand the importance of the Chinese market. PC sales are declining in developed countries while Chinese customers with newfound affluence are buying Apple devices at a furious pace. This growth means that China is now Apple’s second highest-grossing market in the world after the United States. The growth potential for Apple is so great that Apple’s CEO Tim Cook has said of China: “The sky is the limit”. Once upon a time, everything in China required Windows. Whether you wanted to chat with friends online or manage your bank account online, China was for years firmly in the Windows camp (and even “boasts” the largest number of Internet Explorer 6 users in the world – an 11 year old operating system incompatible with thousands of modern websites). 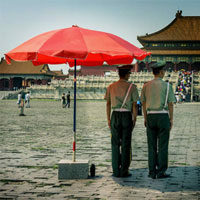 That is changing as China slowly adopts Apple platforms as they become increasingly popular. Taobao supports Mac OS X for sending funds and Chinese banks are slowly beginning to get the picture. Meanwhile the powerhouses of Chinese internet, QQ and Weibo are available on nearly every Apple device, and iOS is the go-to platform for many mobile developers in China (not due to sheer user numbers, but in average revenue per user, an industry figure to calculate the relationship between user base and revenue). 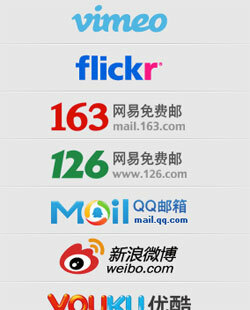 China woefully backwards internet is slowly modernizing. Sina’s super-popular Weibo service was added directly into both iOS (the mobile operating system that powers iPhones and iPads) and Mac OS X Mountain Lion by Apple in 2012. Input your username and password once and you’ll receive notifications whenever someone messages you on Weibo, automatically. Check out the “Mail, Contacts, and Calendars” section of the System Preferences on your Mac and here’s what you’ll find now: options to add accounts for popular Chinese internet services like 163.com, 126.com, QQ Mail, and more. 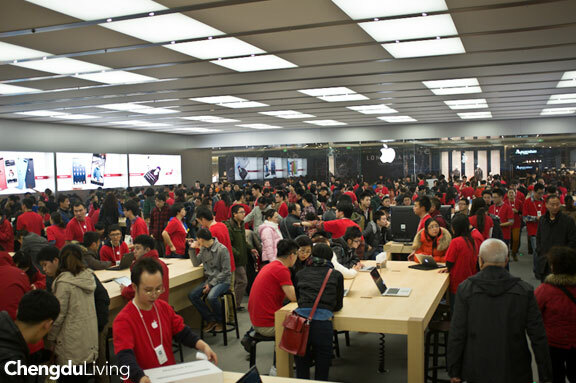 In recent years fake Apple stores have been appearing all across Chengdu, usually selling Shui Huo (?? ), or illegally imported, Apple products. How is one to know which Apple Store is the real one? I doubt much confusion will remain after the impressively large and unmistakably authentic Apple Store opens in Chengdu this weekend. One question regarding all the fake Apple stores is what happens to the impostors when Apple is in town? Only time will tell. One thing that I think is a safe bet, though: Apple’s influence in China will continue to accelerate. And at the very least, we’ll now have an official outlet to purchase Apple products in Chengdu. The days of wondering on which illegal boat our iPhone made it’s way to China from Hong Kong might be numbered. I showed up at the Mixc Shopping Mall (designed by noted American architecture firm Callison) on opening day, an overcast Saturday afternoon. Luxury shopping malls are opening in Chengdu at an incredible rate, and this was yet another one that I hadn’t been to before. The mall itself was sparsely populated with holiday shoppers until I found the Apple Store on the ground level. The single-level store was packed with hundreds of customers, the crowd dotted by Apple retail employees wearing bright red shirts. 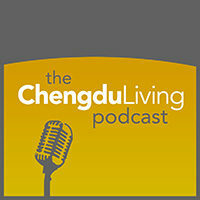 I’d love to hear what you think about Chengdu’s new Apple Store. Will a fourth quarter with greater presence in China bring Apple’s stock back up to record-breaking territory? Does Apple stand a chance against Android and regional competitors in mobile computing? Let me know in the comments below. Great news for Chengdu and good luck to Apple, I believe this will help thousands of Sichuanese make up their mind and get their first Apple device. However I’d really hope Apple can continue what it’s good at and go as far as possible even without Steve Jobs, that’d save me and lots of people from complicated computing technology like PC’s and having fun from it. I haven’t had any problems with iTunes 11 personally – which features didn’t work for you? I like the album centric view since I normally sort and listen to music by album. I’d rather look at album art than lists of artists or songs, too, it reminds me of flipping through stacks of vinyl. iTunes can be an unwieldy beast though, it does so many things (Music player, App Store, Book Store, iOS sync manager, etc). 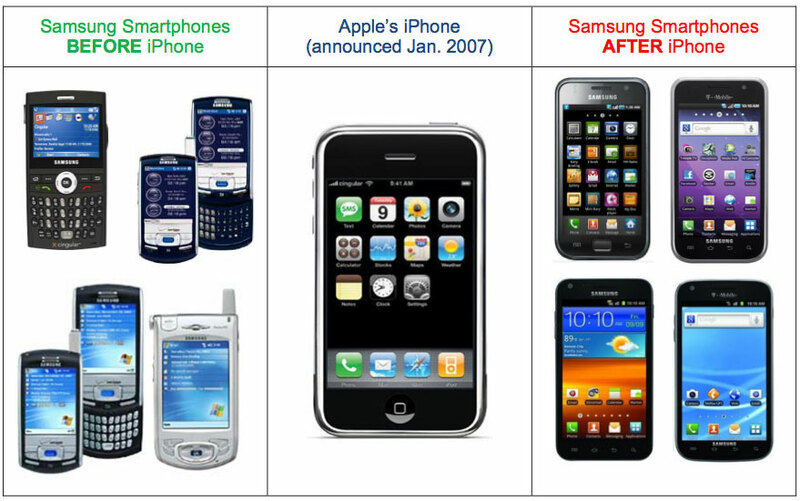 wow, that article from BI is an eye opener, very interesting… but not surprised, it’s Apple. My biggest issue with iTunes 11 was the flexibility, I almost always prefer to listen to my playlists, with shuffle on, album view doesn’t do shuffling for me and it cannot be seen as playlist if I remember right, songs view is lack of artwork display and has weak shuffling too. I was for a moment lost and had no clue how to play, so I had to either change my routine or roll back, and I rolled back to have cover flow again which can be freely ordered and sorted together with the left bottom corner’s artwork display, and both of them can be turned off if I want. Other than that are issues that I can get used to I reckon, like the search and the font and Up Next instead of iTunes DJ. What frustrated me about iTunes 11 is that Apple wouldn’t mind cutting certain features that people have relied on for years, for whatever reason it is, or it could simply be more thoughtful to only add features and make users keep their old preference if they want. And btw, I didn’t see genius bar from your photos, there must be one right? There is a playlist view as there was previously – what I like about it is that you can change view modes while looking at playlists. I created a smart playlist for songs added within the last 3 months, and then I can display them as album covers. Pretty neat. I was definitely lost at the beginning also though. Apple did cut a few features (R.I.P. Ping) and it has a history of doing this. Ruthlessly simplifying. It did the same thing with Logic Pro and Final Cut last year to overwhelming outcry. I think this overhaul of iTunes is similar with the main difference being the former are for professionals while the latter iTunes is for consumers. There actually isn’t a Genius Bar in the literal sense. I asked about this also, there are two tables dedicated to Geniuses. When I asked about this the Australian fellow said “We have a whole floor for Geniuses in Sydney). Glad that this should make repairs and service easier for everyone. I remember running between vendors at “tech tower” all of which wanted to charge upwards of 400RMB for a simple power adapter. Yet I’m a luddite when it comes to the “i craze,” not only do the vast majority of smart phone user not require internet in their pockets, few fully use their products to their full capabilities. Apple, like Starbucks has simply become a status symbol, rising from the underground of personal computing to blanketing the music and communications industry. And at what expense? Chinese workers suiciding themselves in response to 16 hour days to keep up with factory production, or the bioaccumulation of heavy metals in the ecosystem. I have a cellphone that was worked fine since 2004, sure I can’t text quickly, but I do my multimedia on the computer, and don’t need to be connected 24/7. Sure, doctors, lawyers, business execs need constant contact, but youth are instagraming their lives away, seeking verification of friendships through facebook rather than personal contact or conversation. I started substitute teaching last week, and things have changed a lot in the past 10 years. High school kids are ALLOWED to eat candy in class, and iPhones aren’t banned, in fact their use is encouraged. So instead helping kids finish their classwork, it becomes an issue of babysitting to monitor their smartphone use rather than trying to make them smarter! Regarding repairs and Apple support, for the first time official support is available in Chengdu. I don’t think this is a very big deal though and I will explain why. When the lock button on my iPhone broke, I googled it to see how difficult it was to repair. Turns out you need to disassemble the entire phone (removing dozens of incredibly tiny screws), replace the lock button mechanism, and reassemble the phone. While you’re in there you have to be extremely cautious or you’ll break something else. In the US this fix costs $400+ but in Chengdu I found someone to repair it for $30 in about 20 minutes. I stood over his shoulder and watched him perform the entire operation, amazed. It was 1pm in the afternoon and the guy had bed head and a cigarette dangled from his lip. I have a Mac guy that I go to in Chengdu who can do everything. He upgraded my RAM, installed my SSD, and changed the battery in my Macbook Pro. He doesn’t even charge me for service and everything is dirt cheap. So for this reason I don’t see official Apple support as a big deal, personally. Not everyone has the means to get this kind of repair service, but it is certainly available in Chengdu as in Shanghai and Beijing. About everyone being connected these days: that is just a feature of the modern developed world. Everyone is connected all the time, even 13 year olds as you say, because it confers advantages. Immediate access to information which helps people make better decisions in everyday situations — whether it’s what the weather will be like tomorrow, what the traffic on a certain street is like, the current location of friends, or something else. The principle downside seems to be that our focus is compromised because we’re always multi-tasking. But for better or worse, our future is more information, more connections, and the acceleration of events and our reactions to them. I think it is very convenient to be able to get cheap repairs here, but I disagree. I think it is a big deal personally. A couple of months ago I had my MBP Retina screen replaced in an Apple store in Hong Kong because of a dead pixel. It was a minor problem, but extremely annoying for me. If I had to get the screen replaced out of my own wallet, I don’t even want to guess what it would’ve cost me.. I recently gave up my iphone 4s for a Galaxy s3. One of the things I miss about Apple is knowing that if something goes wrong with the product(provided it’s within warranty of course) I can just take it back and get it fixed or replaced with a minimum of fuss and for free, in a few minutes. Don’t knock the freeness buddy 😉 Also you can trust them to do a good job, and they guarantee the repair/replacement for 3 months. AFAIK, no other electronics manufacturer has aftercare like Apple. It is an underrated selling point of theirs. Are you talking about Applecare, or ordinary warranty service? I’ve never gotten Applecare for any Apple products and I haven’t regretted it yet because you can repair every problem I’ve encountered in Chengdu very cheaply. The kinds of things I’ve done for cheap here are replacing home and lock buttons on iPhones and iPads, replacing batteries and upgrading MBP components, motherboard repairs, etc. If I were outside China it would be a different situation though since these kind of repairs are very expensive outside of China. Surprised you got a dead pixel on your Retina MBP – did you check for that before purchasing, or did it appear after purchase? Any iTunes gift cards in evidence? Good question Melina – I didn’t see any. That’s not to say that they aren’t there, but they weren’t prominently on display. Gifts cards do not appear on the Chinese Apple Store website either, so I would assume that for some reason they aren’t available here officially. Great article Charlie, thanks. As a former 4-year Apple Store employee, it was really nice to go and check out the store on Sunday. It was still really crowded then, and as you said, the rest of the mall was dead. In the US, this would be considered a large store, though Apple is moving to larger stores in general. It also has the new Genius Bar design, multiple long tables instead of the old “bar” at the back of the store. Geniuses now bring a Macbook Air or iPod Touch (enabled with diagnostics software) to assist you, instead of working at a fixed station. The stock rooms, offices, and break rooms are along the long sides of the store, accessible through employee-only doors at either end of both sides. I like that the store has two equally large entrances, one facing the street and one inside the mall. The only problem is the construction in front of the store makes it invisible to passing traffic—for now. When the work is done, passing traffic on that main road will see the glowing Apple logo and store traffic will only increase more. As far as the benefit of the store for repairs, the main one is for devices that are in-warranty (or AppleCare, which I definitely recommend for any Apple computer). You can now go the store for free repairs and you know that they are conducted by people with the same training as any other Apple Store in the world. Otherwise, unauthorized repairs void you warranty. I’m looking forward to the second Chengdu Apple store at Raffles Square… Sounds like spring. Hopefully it won’t be delayed like the MixC one was. An employee told me it had been scheduled to open in the summer, but kept getting pushed back. Thanks for illuminating so many things, Damian. I didn’t even notice the street entrance or the store from the outside, I was cycling along second ring road looking for the Mixc shopping center. It is gigantic, and not only has an Apple Store in it but a Toys-R-Us. I had no idea those were even in Asia. The decentralization of the Genius Bar sounds really smart. I noticed something similar when I bought an iPad 3 this summer at the Mall of America in Minneapolis (which directly across from the Microsoft Store is a story in itself). I didn’t go to a cashier, the employee I was speaking to fetched the iPad from the storeroom and checked me out in about 90 seconds using an iPad. Pretty incredible considering every other crowded retail operation on earth necessitates standing in line. I’m looking forward to the Raffles City Apple Store as well. That location was made for an Apple Store, much more so than Mixc in my opinion. There are innumerable shopping malls in Chengdu but Raffles City stands apart in terms of location, design, and functionality. I believe an Apple Store at that location will attract many more people, too. It is amazing how much change we’ve seen, that’s for sure. Great article Charlie. I have used apple products since the early 90’s, but recently have become disillusioned with the whole Apple ethos. 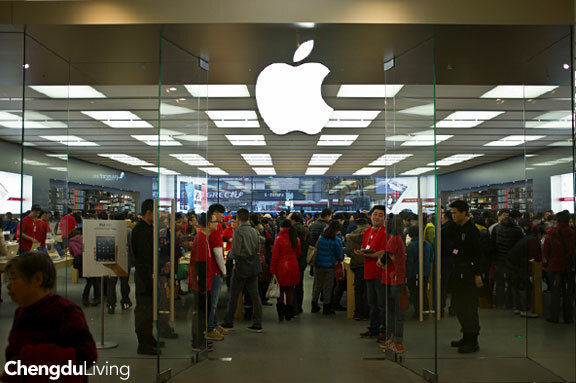 With China’s current obession with brands of course apple is going to be popular. I know some Chinese people who have saved two months salary just to purchase an iPhone 5 (5288rmb) UK (£449) USA ($199) the Chinese are being taken for a ride and mostly for face or peer pressure. The price should be based on the local rate of income. We have to also look at the social and enviromental impact of these global brands. “…to each according to his means”, eh? well, i guess it’s the right country for that. I don’t think the Chinese market is being taken for a ride more than anyone else is. The price difference can be attributed to carrier subsidization in the U.S. – which ends up costing you a lot more than buying the phone outright when you factor in 2 or more years of service. The principle reason why Apple products are more expensive in China is because of the 17% VAT tax. If the price of luxury goods followed regional median income, BMW’s, Starbucks, and Levi’s would be cheaper in China than anywhere else. Obviously this is not the case and that system of price fixing really wouldn’t make much sense. International luxury companies rightly see China as the most important market in the world because there is an enormous amount of wealth being created here right now. Actually ‘regional median income’ is a factor in pricing believe it or not, or should be, along with rent and, as you mention, taxes. Luxury items are not immune. They are all costs. You do hardly notice this with consumer goods (as opposed to high labour content services) but it is there. I don’t know about the combined impact of consumption taxes in the US (I thought they are quite high) but the VAT makes sense in China – reduces your reliance on personal income taxes and forces everyone to pay their taxes. But apart from that, multinationals will discriminate across geographical markets if they can get away with it. Again it makes sense to take notice of capacity to pay. It is a constant talking point in Australia where consumers get the pleasure of paying over the odds for anything from Apple. But we have high wages and rent .. that is a factor. Per capita GDP is a fraction of what it is in the US, yet luxury goods are frequently 30% or more here. If the median regional income being low doesn’t actually reduce the cost, to what extent is that a pricing factor? Apple & Samsung (and everyone, basically) charging what they can charge is the nature of capitalism. If the price were too high, people wouldn’t buy it. The median income in China is a misleading statistic when gauging the buying power of the market though, due to China’s polarized economic distribution. A vast majority of the population cannot realistically purchase an iPhone but the 1% of the population which has accrued a large amount of wealth in recent years can easily afford it. A major difference between developed Western countries and China is that this 1% constitutes many more people and sales. This is why China is Apple’s second largest market despite having an $8k USD per capita GDP. 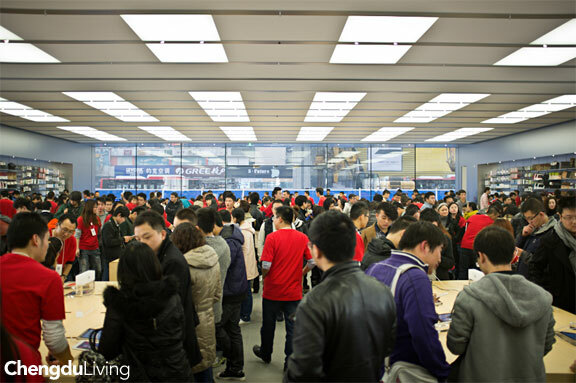 How long before you guys have your iFights like they have in front of Apple stores in Beijing? I think Apple China learned an important lesson after that event – I don’t see it happening again. The demand for some Apple products is so high that you really need elaborate systems to prevent scalpers from preying on customers in China. My understanding is that under Tim Cook Apple has dramatically improved its supply chain management so product shortages might be a thing of the past. That might be wishful thinking though. We’ll see. They’re Apple, so I’ll go on a limb and say that they’re aware of the dozens of fake Apple stores blatantly positioned around Chengdu. I would agree that the fake Apple Stores are superior to the legitimate one if the judging criteria is number of employees that insist that you install Windows on your Mac immediately. I agree with you about location – I hadn’t even heard of the Mixc shopping mall, and it’s in an area of the city that I almost never go to. Raffles City seems like a better fit to me. Some of those apple stores are legitimate re-sellers, for example Xinya. That is why the prices on the devices are exactly the same price as buying from Apple because those stores only make money off of the accessories. Apple doesn’t mind these legitimate resellers because they still capture revenue from the devices and helps them gauge the demand in growth cities like Chengdu. This is a brilliant way to test a market without the large capital expense commitment for setting up an Apple Store. Its also why they are in no huge rush to roll out hundreds of stores in China because they are still selling product. Correct me if I’m wrong, I believe that Xinya is the only authorized reseller in Chengdu. 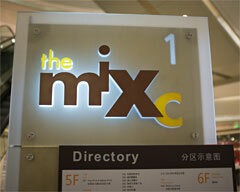 There are a few locations that I know of – inside the Galleria and Raffles City malls. These are definitely outnumbered by fakes though, a recent trend that I’ve noticed is that they only feature an Apple logo as the signage (previously they used to say things like “Apple Store”). I want to say there is one more authorized reseller but the name evades me and I could be wrong. The thread mentions plans to open an apple store in Raffles. It will be interesting to see what Xinya does as they have a great location ground floor at the mall entrance.